Scholarships and Grants are available through Brandywine Valley Quilters. Areas of interest: Textiles, textile design, fabric, sewing, quilting, weaving, felting and fabric-related technology. Scholarships and grants are offered annually by the guild. Applicants' primary residence must be in New Castle County, DE or Delaware County, PA, or Chester County, PA. Applicants for scholarships... must be or have been a student in good standing who is pursuing or plans to pursue post-secondary education or training in textile or fabric related technology or arts. Applicants for grants... must be teachers or instructors in a public or non-profit school, institution, organization or a nonprofit organization or group Grants are intended to aid teachers or instructors in public or non-profit schools, institutions, or organizations with the expenses associated with teaching/training, such as supplies, equipment, or other educational materials. At the recommendation of the 2018 Scholarship Committee BVQ has awarded the following grants and scholarships. The Meadows creative workshops include a Fiber and Art Workshop where guild members make knitted pillows, stuffed animals, mosaics, and decorative bookmarks that are sold at The Meadows on the campus and through an online store and craft fairs. The summer program operates out of the Cab Calloway School of the Arts and its goal is to invite children to experience creative (arts) education alternatives with community outreach and scholarship opportunities for underserved populations. They offer a minimum of 150 full scholarships to low income students including breakfast, lunch and transportation. They offer Basic Sewing for 3rd to 8th grades and Advanced Sewing for 5th to 9th grades; Fashion and your 18” doll to learn how to sew for you and your doll; Puppets for 6th – 8th grade, and Understanding Sewing Patterns for 8th – 12th grade. Quoted from their letter. We have been offering sewing programs for many years and it has taken a toll on our machines. I am requesting a grant for servicing these machines. Based on information given to me by Stephanie Hayes (Hayes Sewing Machine Co.) we are asking $720 for servicing 6 to 8 machines. ($90 per machine. If we do not need parts we will have all 8 machines serviced. The Hickman requested funds to work on an Intergenerational quilting project between their residents and the students from the West Chester Friends School. They plan to make five to ten quilts with a combination of hand-painted and pre-designed squares. The quilts will be donated to the West Chester Friends School, so students can use them while sitting and/or working on the floor, both in and outside. The funds from BVQ will be used to purchase equipment and fabric and to pay a skilled quilter to lead and assist Hickman residents and students in designing and completing the quilts. Plans are to host this activity throughout the fall and finish up before the end of the year. Lauren is a 2017 graduate of Garnet Valley and just completing first year at Temple-Tyler School of Art. She is majoring in Art Education. She would like to pursue a career teaching at a middle school or high school using art to aid in educating students. “Drawing, painting and sewing have brought me so much joy and have allowed me to express myself more creatively.” Art Therapy is a growing field that interests her. In the past, she has utilized fabrics as a transparent layer and as the background in her drawing pieces. Her Grandmother, Charon Mohn was President of BVQ in 1988 and her Mother was a member from 1989 to 2000. .
Hope is studying fashion design at Jefferson University. She has been sewing for 7 years and has created multiple garments, home goods and stuffed animals. The money will be used towards purchasing materials for the clothing line she will be creating her sophomore year. Once she graduates she will receive a bachelor of science in fashion design and hopes to work at a design house in New York City. I received the guild’s scholarship in the mail yesterday, and I am incredibly thankful to be a recipient of this award. I am sincerely appreciative of the guild’s generosity in helping me advance my education. This year I will be creating a children’s wear collection for my sophomore project, which will be funded by this scholarship. I will happily send photos of the collection as well as progress updates once I begin classes. Again, thank you so much for choosing me to be a recipient of this award. I am extremely appreciate of the guild’s kind generosity. The 2017 Scholarship Committee has recommended the following grant and scholarship recipients. Everyone who applied has received money. I am writing to thank you again for Brandywine Valley Quilters Guild second $500 grant to the Melmark Charitable Foundation for The Meadow's fiber arts workshop. With your help, we were able to purchase textile supplies such yarn, fabric, Knifty Knitters, and knitting needles. These materials are used by adults with developmental disabilities through our Meadows Program. All participants in the Meadows Program at Melmark are members in their own craft guild called the Country Garden Guild. Members share the income when their crafts are sold through Etsy, through our website, or from their store on campus. We are grateful to you for making their success possible. Madalyn is currently a Junior at Moore College of Art and Design and majoring in Fashion Design. She will use it to further her education by utilizing it to purchase, fabrics, muslin and other supplies. 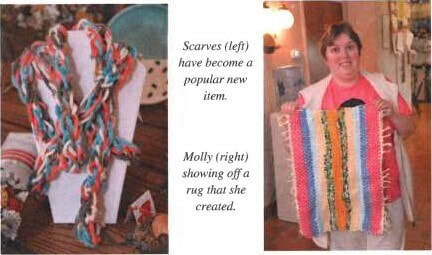 For each project she has completed, she has had custom fabrics made or has made them herself. Hope has been sewing since the age of 11 when she took lessons and has since learned to sew, create garments and design her own patterns and has created garments such as dresses, shirts and shorts. In the fall she will be attending Philadelphia University and majoring in fashion design. She will use the scholarship to purchase fabric, art supplies and books in the fall. I wanted to thank you and the Brandywine Valley Quilter's Guild again for the generous scholarship I was gifted wit for school. I am incredibly grateful. The scholarship has helped pay for almost all of my art supplies for my design class. The materials I purchased with the scholarship will help me throughout my entire college career. I have attached two photos of all of the materials I have purchased using the scholarship. Again, I sincerely thank you and the rest of the guild. See October 2017 Newsletter , page 6 for the photos. “I am currently a sophomore Fiber Major with a concentration in Experimental Fashion at the Maryland Institute College of Art. The past two years I have been fortunate enough to have received the Brandywine Valley Quilter’s Guild Scholarship. This scholarship has allowed me to obtain the materials necessary to grow my skills a textile artist. My work over this past year has been process-oriented. I thoroughly enjoy creating all elements of an object from start to finish. This often includes manipulating the surface of fabric with shibori techniques, batik, and screen printing. With the textiles I have designed, I then bring them into three-dimensional forms, whether that is a garment, a quilt, or a life size animal. The Scholarship Committee recommended the following grants and scholarships which the Board of Trustees approved. The mission of Melmark is to serve children, adults, and their families affected by a broad range of intellectual disabilities. They provide evidence-based educational, vocational, clinical, residential, healthcare, and rehabilitative services, personally designed for each individual in a safe environment of warmth, care, and respect. The Fiber Arts Workshop of the Meadows works with various textiles to create superior crafts. The workshop hosts 5 adults who love needlepoint, 34 knitters, and 9 additional people who are learning the basics of using a Knifty Knitter. Many of the participants also work on weaving projects to make rug runners, placemats and other items. They plan to use the funding to purchase needlepoint material like scrims and yarn, fabrics for weaving projects, warp yarn for the looms, and Knifty Knitters and knitting needles. This grant will fund an AP (Advanced Placement) project with students who are experimenting with dyeing fabrics, designing and making a quilt. The completed project will be on display in the school or district office. Funds will also allow students to take a field trip to see quilts and fiber art exhibits. As many students as possible will be involved in making batik fabrics and the quilt. This scholarship is being awarded to last year’s recipient to continue her fiber art education. Rachel is entering her sophomore year, majoring in Fiber with a possible concentration in Experimental Fashion. She will be furthering her knowledge of dye, as well as learning other crafts in the world of fiber. Next year, she hopes to participate in her school’s annual fashion show and will use the funds from this scholarship to enhance her participation. She will be using the scholarship for art supplies for college in the fall when she attends Maryland Institute College of Art. Last summer she ﻿attended the precollege courses at Maryland Institute where she made several pieces of clothing out of paper and took painting and sculpture classes. She wrote us, "I know that I want my career to be focused around the manipulation of textiles but I am still undecided whether I will make clothing, sculptures or simply design fabrics." The funds will go to providing materials for 10 economically disadvantaged kids this summer. In 2015, their 6th year, they will serve approximately 650 individual campers for 65 individual arts-related courses. The funds will go toward the courses teaching sewing skills. The Fashion Patrol is an older Girl Scout magnet group for girls 6-12th grade with a passion for fashion. They hold monthly sleepover workshops on many sewing topics. They have held a Fashion Runway where the girls have 24 hours to redesign an "ugly bridesmaid" dress into a creation of their own and wear it on the runway. Other workshops include costume play, recycled fashions, Baby Bundles, fiber workshops trying out a spinning wheel and drop spindle, needle felting, knitting, crochet and locker hooking. They will use the funds to get some dress forms that are used in their workshops and to help girls to go to Summer Arts Programs offered at local colleges. $250 to Sewing Classes at Rockwood Museum sponsored by the New Castle Co. Division of Community Service. The program teaches sewing basics to girls in the Wilmington area at the Rockwood Museum located in Wilmington, DE. They learn to use a sewing machine and have made small, simple quilts for Project Linus, a bandana backpack and cat and dog beds for Faithful Friends of the Delaware Humane Society. The funds will be used toward the purchase of sewing machines and fabric. The Cab Calloway School of the Arts ﻿Summer Camp was held at McKean High School in Wilmington, Delaware. During the summer of 2014, Brandywine Valley Quilt Guild made it possible for five girls (one girl for each of five weeks) to go to a session at no cost to her. Each girl attended a one-week summer school program to learn to sew and use a sewing machine. The older girls learned about a sewing machine and made a piece of clothing. It was a full day of sewing classes with breaks in the morning and afternoon and one session a day in the gym. On Friday the parents came to see what the girls had accomplished during the week.